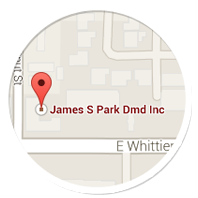 “We have lived in the La Habra/East Whittier area for 40 years and our family dentist was Dr. Fliss for nearly 30 years. When Dr. Fliss retired, we were very concerned about who would be our family dentist. Dr. Fliss eased our concerns when he told us how much confidence he had in Dr. James Park, who would be taking over the practice. We valued Dr. Fliss’s opinion and we always enjoyed and appreciated the team who were going to work with Dr. Park. They have always been friendly, considerate, and professional. “I have never been a big fan of dentists and consequently not a good dental patient. Since ‘hooking up’ with Dr. Park, I now look forward to going to the dentist and in fact sometimes stop by even when I don’t have an appointment — who knew! Dr. Park and his staff make going to the dentist a pleasant experience. Everyone in the office is so helpful, friendly and happy; the atmosphere is like a family. “The thing I like most about Dr. Park is his ability to treat more than just routine dental care. Since starting with Dr. Park, I have had some major dental issues, most likely due to lack of due diligence in the past. Instead of being sent off to a specialist who I had no relationship with, Dr. Park was able to treat all my needs. His care for his patients goes beyond your office visit when you have a major procedure…. he follows up with a phone call to be sure you are doing well.